Ultrasonic cleaning is extremely fast and powerful. At the heart of Ultrasonic Cleaning is the bubble; actually, lots of bubbles. These bubbles are created by sound waves as those waves move through water. This is known as Cavitation which is simply the formation of bubbles (a cavity) in water. If you’ve ever seen the foam left in water by a spinning boat propeller, then you’ve seen cavitation in action. First, our bubbles are enormously powerful compared to propeller bubbles. Second, our bubbles are microscopic which makes them incredibly efficient. Since bubbles such as those created through Cavitation are just empty space, there’s nothing to keep them open. As a result, these bubbles collapse, or implode, almost as fast as they are created. In our machines, this happens millions of times per second. This constant implosion produces tremendous vacuum energy in the form of heat and pressure. It’s this combination of heat and pressure which gives Ultrasonics its cleaning capability and power. Why is Ultrasonic Cleaning so Efficient and Effective? 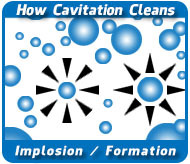 When cavitation happens near a dirty object, the vacuum action produced by those million of bubbles constantly imploding creates a tiny pressure wave that reaches deep into every nook and cranny of even the most delicate items. This tiny pressure wave dislodges and breaks up the dirt and other contaminants and gently lifts it away. The result is very fast and effective cleaning. 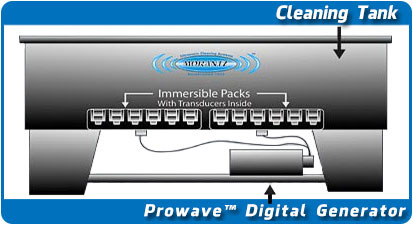 To create cavitation, Morantz Ultrasonic Cleaning Systems use our state-of-the-art Prowave™ Digital Generators to power electro-mechanical transducers that are submerged in a tank of hot water. These generators activate the transducers which then vibrate very quickly. 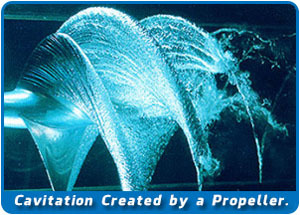 This vibration sends sound waves through the water at frequencies ranging from 25 to 40kHz which produces cavitation.